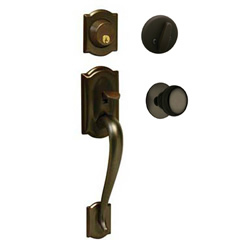 The Schlage Camelot handleset is availabe with several interior knob and lever options and multiple finishes to match your other schlage locks or home decor. Choose from the pull down menus above to customize the handleset that is right your you. 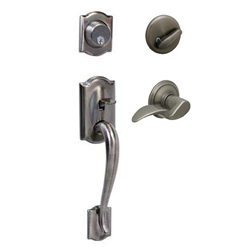 Schlage handlesets can be keyed alike your other Schlage products. 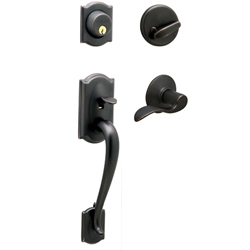 Split finish handlesets are available upon request. Every aspect of the product from the order process to the final installation was excellent. Received complete order in just a few days, sturdy packaging, and quality product for the replacement door after flood damage from Hurricane Harvey. Love this handleset. The quality is good, love the color. Installed very easily. only one hole to core. Looks great. Just as displayed. I'd recommend it. 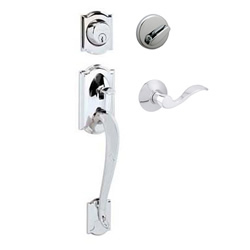 I bought this handle for the Schlage name in durability and reliability, and for it to compliment a style the customer was looking for. 100% satisfied on both accounts. I am very happy with my new door hardware! It looks wonderful. Love the electronic lock and handles. So easy to install. Looks fantastic! 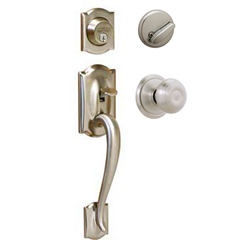 The lock is a good heavy duty latch. It is made well and very strong. It looks great on the front door. Because of limited space between the middle of the door and the glass in our new doors, our options were fairly limited. Jake informed me that my first choice was backordered from the manufacturer and wouldn't be available in the short turn around I needed. My second choice was found in a warehouse in neighboring NV and was shipped same day. Nathan in customer service ensured the hardware was shipped within 30 minutes of an email note. This company understands customer service. Thanks DDH. 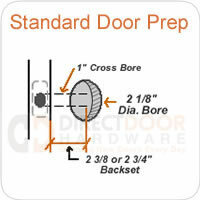 We ordered the working set and the dummy set for a double door entry. Install with my teenage son went great, took about 1 hour to complete both doors. Had to drill a larger hole in both doors for the lower handle connection. 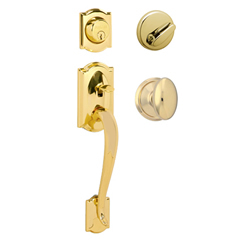 Don't forget that you may have to repaint the outside of the door if this hardware doesn't match your old hardware! The set is lovely on our black front door. 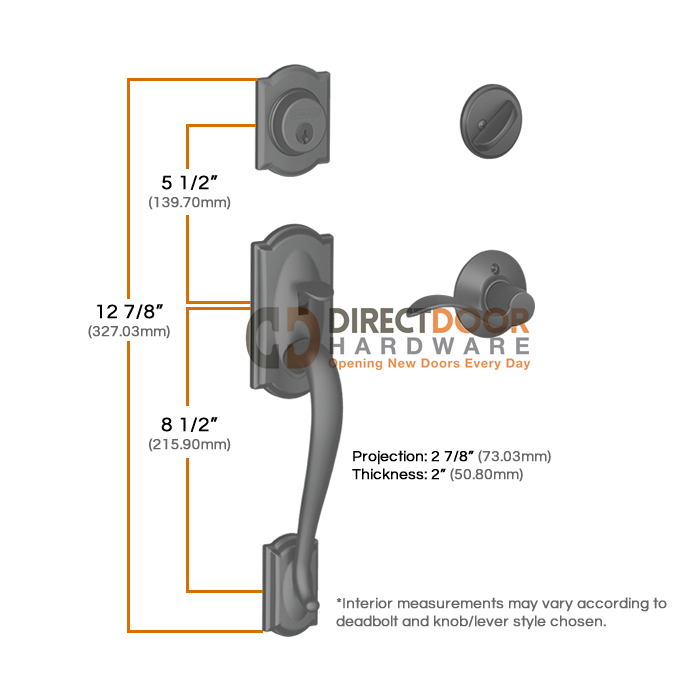 I was expecting the piece that goes in the door frame catching the deadbolt to be much thicker -the description on the box makes you think you couldn't kick the door in - might be true for the door, but the jamb i'm not so sure. Beautiful set and great service ! Would buy from you again! Ordered this set for our new house and love it. It looks great, works great, and we've gotten compliments on it. Shipping was fast and the price was good for the quality. What's the material of the hardware parts? Brass? Zinc alloy? 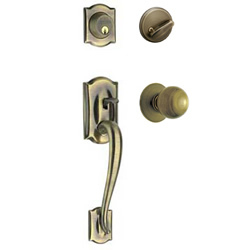 •Outside trim: Handlesets are solid forged brass; wrought brass trim rings with concealed security inserts. •Inside trim: Levers are zinc-based plated to match finishes indicated. what's the difference between single cylinder and double cylinder option ? Will the through bolt adjust down to 7 3/4"?